The company that owns Welham Green’s Hope and Anchor on Station Road says it’s hopeful that the pub will open shortly. The announcement follows confirmation that a new tenant has been found for the 19th century pub. Ei Group, which owns the building, says refurbishments will follow once the plans are signed off. It’s been six months since the Hope and Anchor served its last pint, and there were fears locally that the pub had closed for good. A concern that has continually been denied by Ei Group. 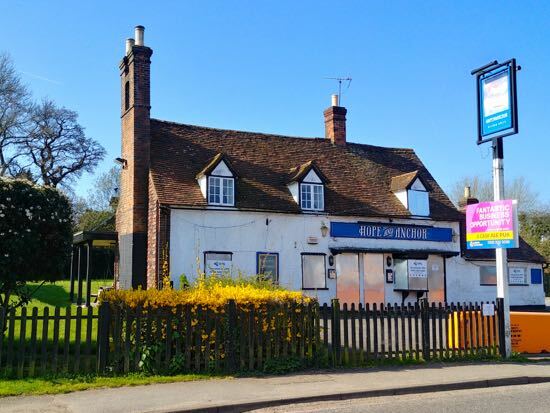 Earlier this month the nearby North Mymms Social Club, also on Station Road, ran an April Fool’s Day prank claiming that the building was set to become a MacDonald’s drive through, a joke rubbished at the time by Ei Group’s regional manager Richard Smyth. The company has told this site that a tenant has been found. Once the new licensee takes over it’s hopeful there will be a facelift for the historical pub. According to Richard Smyth “a refurbishment takes a good few weeks, we haven’t had that signed off yet”. Whether the pub will open to the public next Tuesday when the new tenant moves in is not clear. All Richard Smyth would say was “fingers crossed open Tuesday evening”.